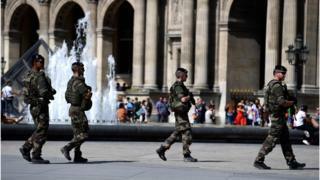 French prosecutors have charged one of the "terrorist commandos of young women" arrested over a foiled attack near Notre Dame Cathedral in Paris. Ornella G, 29, was charged with alleged involvement in a terrorist act and attempted murder. Three other women are still being questioned by police, after a car packed with gas cylinders was found last Sunday close to the cathedral. They are alleged to have been planning other "imminent and violent" attacks. Paris prosecutor Francois Molins said on Friday that Ornella G's fingerprints were found inside the car. She was known to intelligence agents as someone who was considering going to Syria. She was arrested in southern France on Tuesday with her boyfriend, who has since been released. The three other women being questioned by police were arrested on Thursday with a man. Police say they were directed by so-called Islamic State. One of them, identified as Sarah H, aged 23, had been engaged separately to two French jihadists, both now dead, who carried out attacks this year. Another, identified as Ines Madani, aged 19, reportedly declared her allegiance to IS in a letter. Mr Molins said she had tried several times to travel to Syria. The third woman was identified as Amel S, 39. Her 15-year-old daughter, who had been radicalised, was also taken into custody, the prosecutor said. The women and their associates had already been under surveillance but the discovery of the gas-filled car near Notre Dame had pitted the security forces in "a race against time" to arrest them, French Interior Minister Bernard Cazeneuve said. Mr Molins said the investigation of the aborted attack had led to the dismantling of a ``terrorist commando of young women'' aligned with the Islamic State group.